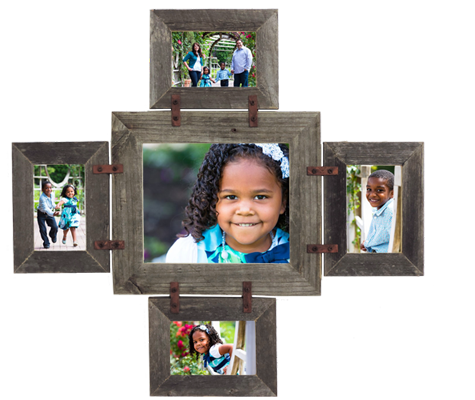 This unique collage frame is made from (1) 2″ 8 X 10 Barnwood Frame and (4) 1.5″ 4 X 6 Barnwood frames. Depending on how you hang it, you can put 1 horizontal 8 X 10, 2 vertical 4 X 6 pictures, and 2 horizontal 4 X 6’s OR 1 Vertical 8 X 10, 2 vertical 4 X 6’s, and 2 horizontal 4 X 6’s. 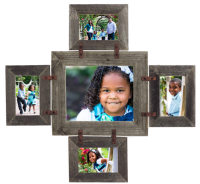 Great for family groupings of a series of photos thematically similar. Available in a number of rustic painted colors at no extra charge.